Multiple days of celebration, with beautiful outfits, grand venues, mouth-watering delicacies, mesmerising decorations, lots of dance, music and masti, and countless other things go into making your Wedding a memorable event! All of these come at a significant cost, often making you go out of your budget. But, since this is a once in a lifetime event, you can make it memorable without cutting corners with a personal marriage loan from your own line of credit by MoneyTap. Multiple days of celebration, with beautiful outfits, grand venues, mouth-watering delicacies, mesmerising decorations, lots of dance, music and masti, and countless other things go into making your Wedding a memorable event! All of these come at a significant cost, often making you go out of your budget. But, since this is a once in a lifetime event, you can make it memorable without cutting corners with a personal marriage loan from your own line of credit by MoneyTap. I'm a perfectionist and pre-planned my wedding for over 6 months. It came as such a surprise to me when I was met with so many last minute expenses that I simply couldn't avoid. Luckily MoneyTap came in handy. I was able to take care of all the little expenses without having to rely on anyone. The end result - my dream like wedding became a reality. Use our online EMI calculator for marriage loan and know the exact amount you need to pay every month in just a few seconds. Try various combinations of the loan amount, tenure and interest rate to choose the EMI that you can comfortably pay. Options to Get Your Perfect Engagement Ring! What are the Typical Indian Wedding Costs? Why Getting a Personal Loan for Your Wedding Makes Sense? A marriage happens once in a lifetime (that’s what we hope for) and we want to do our best to make it as grand and impressive as possible. So, it makes perfect sense to rely on a personal marriage loan if needed. It helps you avoid potentially undesirable situations like dipping into your savings, using credit cards or selling off your valuable assets. A marriage loan helps you preserve your savings which you can use for your honeymoon and other future expenses. With increasing expenses and inflation, you may end up making half-hearted choices being restricted to a tight budget, but with a personal loan for your wedding, you have the option to choose what you desire for your wedding. Financial help with a marriage loan in India is a viable alternative for covering unanticipated expenses. When you need to work on the budgeting part, a marriage loan gives you the freedom to decide how much you want to spend on the wedding. Know how much money you need up front so that you don’t end up borrowing more than what you need to avoid paying unnecessary interest. Make sure you keep your wedding budget reasonable so that paying off your loan becomes quick and easy. Always make an extra 20% cost estimate for miscellaneous costs. This will keep your finances in order. While taking a marriage loan, also take into account the expenses required for various ceremonies along with other financial goals such as your honeymoon, buying a new home or shifting to a bigger house. With MoneyTap’s line of credit you will have money available instantly 24x7 to use anytime, anywhere. Click below to experience its power. What is a marriage or wedding loan? 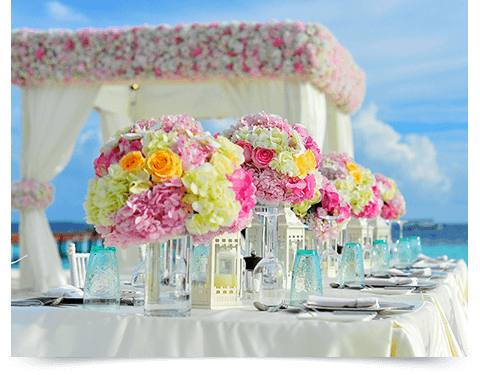 A marriage loan or a wedding loan is a special occasion personal loan that you can be taken to pay for wedding-related expenses. Why should I finance my marriage with a personal loan? If you are getting married soon or have to pay for your child's wedding and don’t know how to deal with the added expenses, then a personal loan can come in handy. It is an excellent option if you don’t want to dip into your savings, risk your assets or liquidate your investments to pay for a wedding. Getting MoneyTap's line of credit also allows you to borrow funds as a marriage loan to help pay for your wedding expenses. Plus, you can use the credit line for other purchases as well. How much can I borrow from MoneyTap for a wedding loan? Depending on your eligibility criteria, you can get approved for a credit line starting at ₹ 35,000 up to ₹ 5 Lakh. How soon can I get a marriage loan from MoneyTap? You will come to know if your wedding loan is approved almost instantly. Once you download the app and fill in your details, the processing happens very quickly. Your pre-approval should not take more than 4 to 5 minutes. Once the final approval is done, you can get a marriage loan from your available line of credit instantly. Which wedding expenses can I pay for with a marriage loan? What are marriage loans by the government? Apart from these government schemes, various other marriage loans for girls have are being offered by private banks. What are the current interest rates for wedding loans? The current interest rates on wedding loans in India range between 10.75% and 19% with loan tenures that range from a period of 1 to 5 years. MoneyTap's marriage loans begin with interest rates as little as 1.08%.